Posted on Thu, Oct 27, 2011 : 1 p.m.
Eastern Michigan quarterback Alex Gillett hands off to Dominique Sherrer during the Eagles' 14-10 win over Western Michigan last Saturday at Rynearson Stadium. An Eastern Michigan bandwagon that was picking up passengers at a steady rate is sidelined while the Eagles football team has an off week on its schedule. But coach Ron English is more grateful for the time off than he is concerned about losing momentum after back-to-back wins over Central Michigan and Western Michigan. Taking good care of those running backs is a high priority, since they’ve accounted for most of the Eagles’ offensive success. 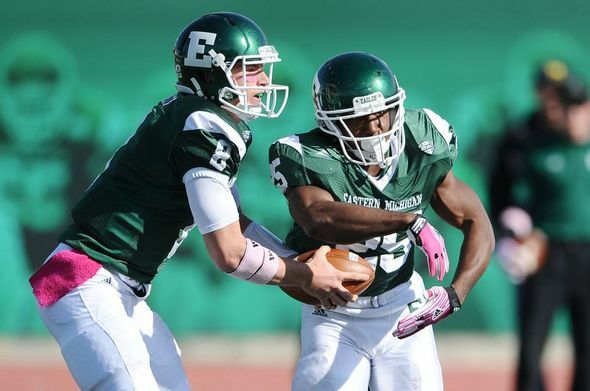 Eastern (5-3, 3-1 MAC West) is averaging 226.1 rushing yards, which is 16th-best in the nation. Of course, it helps to have multiple players contributing at the position. Junior Dominique Sherrer, the starter out of fall camp, returned from a five-game absence due to injury to lead the Eagles with 86 rushing yards on 11 carries against WMU, but sophomore Javonti Greene was the MAC West offensive player of the week after scoring on a 50-yard reception and a 50-yard run. Greene (4), Sherrer (2) and Dominique White (2) have all started at the position this season and all of them have at least one 100-yard performance. When the Eagles return to action they’ll find themselves in an unusual position - in MAC title contention in early November. Currently one game behind Toledo for the MAC West lead, the Eagles will play consecutive home games against Ball State (5-3, 3-1 MAC West) and Buffalo (2-6, 1-3 MAC East). Will the fans return after the off week? On this week’s MAC coaches teleconference, English twice referred to how exciting it was to have the full student section that attended the WMU game at Rynearson Stadium. “To be involved in a place that’s improving and growing - there’s some excitement there - it’s a lot of fun for me,” English said. Thu, Oct 27, 2011 : 10:29 p.m.
Come out of this well deserved week of rest swinging Eagles!! Take no prisoners! Extend the streak!